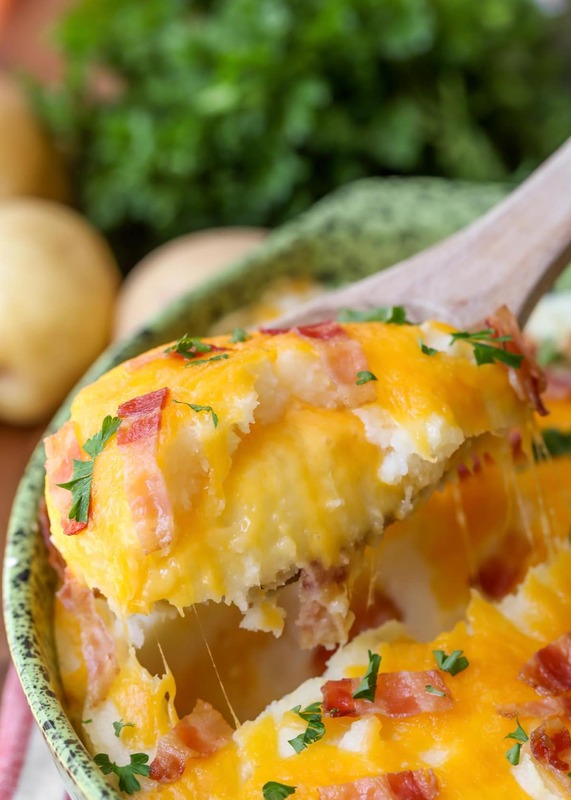 Our Stuffed Mashed Potatoes have layers of mashed potatoes and cheese all topped with bacon. 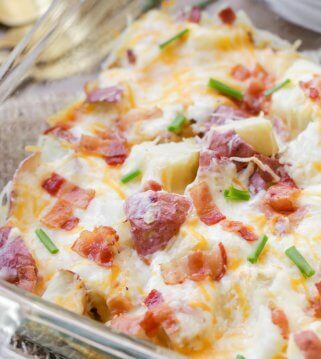 This potato casserole is perfect for dinner and holiday meals! 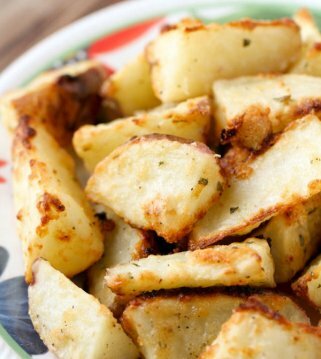 We also like to try out new potato recipes so we can share out favorites with all of you. 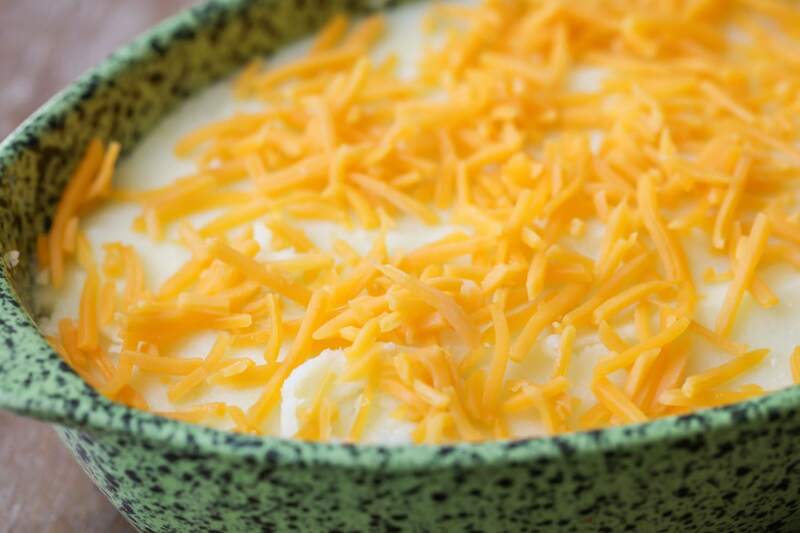 Today’s recipe for Loaded Mashed Potatoes happens to be a new favorite and one I think you will enjoy too. 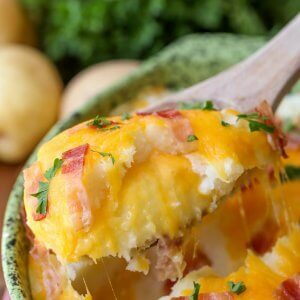 With bacon and cheese on top and a layer of cheese in the middle, these potatoes are sure to be a hit! You can see from the picture above all the cheesy goodness which makes this recipe a winner in our books! 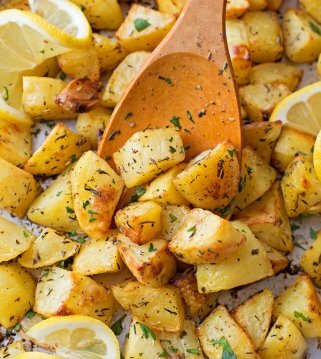 With the holidays fast approaching, we love to have yummy potato recipes for Thanksgiving AND Christmas, and I know many of you do too. 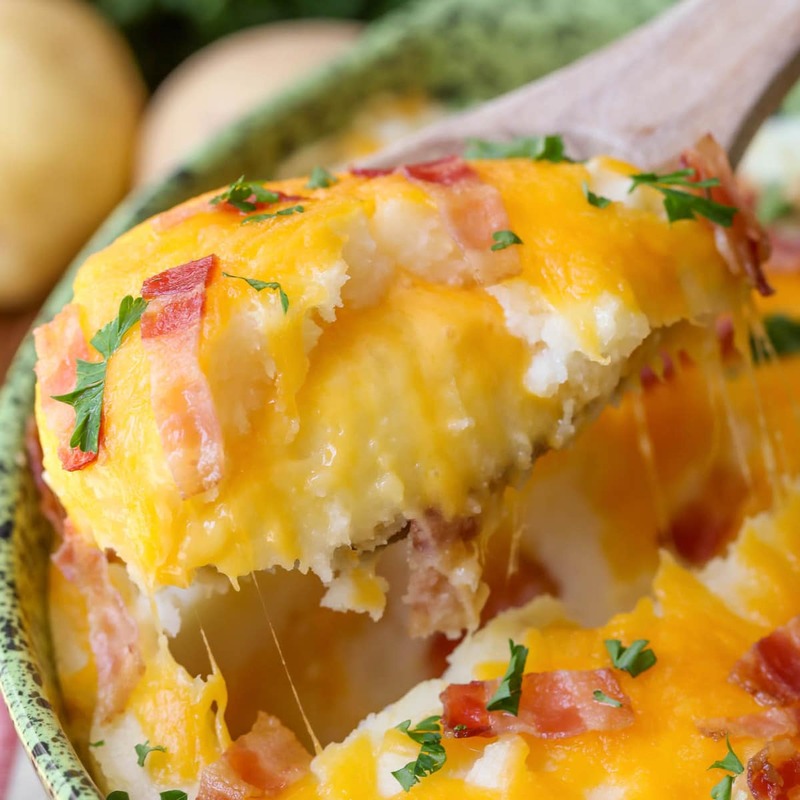 In the past, we’ve always had classic Mashed Potatoes, but over the years we’ve tried other recipes like our Twice Baked Potato Casserole or our Parmesan Sweet Potatoes. To make these potatoes, you begin like any classic mashed potatoes recipe – you boil the potatoes in a large pot of water. Once the water is drained, you add the potatoes back to the pot, along with butter, sour cream, garlic salt and pepper. Mash the potatoes until they are smooth. Then, you will spoon half the potatoes into a greased pan, cover with half the cheese and bacon, and then add the remaining potatoes. Sprinkle on the rest of the cheese and bacon. 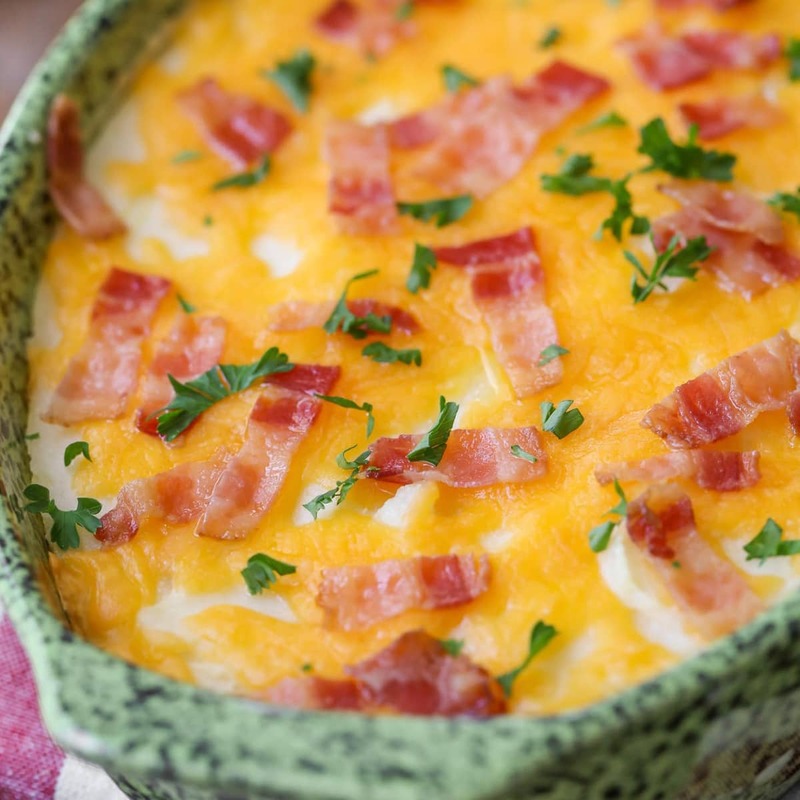 Bake this for 30-35 minutes to have delicious loaded mashed potatoes. You won’t believe how delicious they are. Can you make this dish ahead of time? Indeed. Just keep refrigerated and covered for up to 48 hours in advance. Bake for an additional 5 minutes. 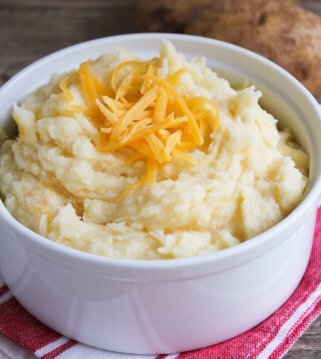 Other toppings for loaded mashed potatoes? Chives, green onions and chopped parsley are our go-to’s for these! 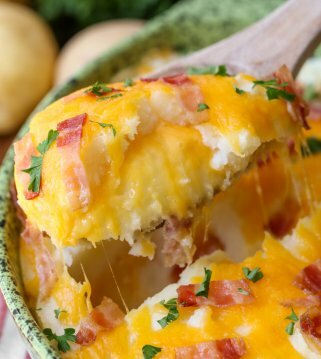 Cheesy Mashed Potato Casserole - layers of mashed potatoes and cheese and topped with bacon - perfect for dinner and holiday meals! Boil 8 cups water in a large pot. Add potatoes and cook for 20 minutes or until tender. Drain water and return potatoes to the pot. Add butter, sour cream, garlic salt and pepper to pot and mash until smooth. Spoon half of the potatoes into a greased 8x8 pan. Cover with half cup of cheese and half of bacon crumbles. Add the rest of the potatoes to the pan and top with remaining cheese and bacon crumbles. Bake for 30-35 minutes. Add fresh parsley if desired. ENJOY! Recipe adapted from Kraft recipes. Can’t wait for the holidays to indulge in more potato dishes. Amy…they are one of my weaknesses, too!! 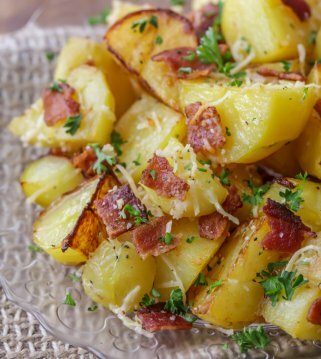 I don’t wait for a holiday to have some kind of potato dish! Thanks so much for sharing!! It tastes good, too!! Hope you’ll try it soon! Thank you! We love potatoes at our house, so we were excited to try these. They were a hit They were so cheesy & creamy! These will be great for the upcoming holidays!